IUKF | The Mattson Academy of Uechi-ryu Karate "Virtual Dojo"
believes in thinking globally and acting locally. The IUKF is a world-wide organization that consists of regional Uechi-ryu dojo that conduct black belt grading twice a year, based on Internationally recognized standards documented in the Black Belt Test Guide and interpreted/clarified by the IUKF “Rules Committee”. The IUKF is a member of the South China Martial Arts Alliance [SCMAA] and the Okinawa Family of Uechi Organizations. You can participate in the future of Uechi-ryu by joining the IUKF today! The International Uechi-ryu Karate Federation (IUKF) is a non-profit educational organization, recognized by Federal and State governments. IUKF is solely dedicated to the common good of International Uechi-ryu and is totally governed, overseen and regulated by IUKF and is built upon the premise of loyalty, trust and respect between and among students and teachers within Uechi-ryu Karate. IUKF members are encouraged to respect all martial arts and practitioners and not to bring disrespect towards IUKF through any actions, words or deeds that might represent IUKF in an unfavorable manner. IUKF members agree to dedicate themselves to uphold the highest standards as teachers and students of Uechi-ryu Karate Do. These standards include personal deportment which should always aspire towards demonstrating the qualities of integrity, wisdom, dignity and compassion. For all IUKF teachers and students of Uechi-ryu Karate Do, these standards include the continual striving for and attainment of the best intellectual and physical karate skills that each individual’s potential allows. To this end, IUKF encourages research into Uechi-ryu and the development of improved teaching and training methods. Furthermore, each IUKF member understands that the practice of Uechi-ryu Karate Do requires dedication and perseverance in harmony with the totality of one’s life and responsibilities. With these standards, IUKF members therefore agree to dedicate themselves to the finest instruction, promotion and expansion of the art of Uechi-ryu Karate Do throughout the world. To these goals, each IUKF member agrees to support and encourage each and every fellow IUKF member. By signing the application for a Dojo membership and being formally accepted by the admissions committee, member agrees to abide by and fully support this charter and all future amendments that might be forthcoming. IUKF has been growing very quickly. Our new site administrator has made great progress re-designing and updating the black belt registry of rank and honors. The old registry has been one of our site’s most popular feature, accessed by thousands of people checking on their rank or others. Now that our registry is being incorporated into other style sites, it is likely that the registry will become the most recognized and accredited repository of traditional martial art rank and honors. In the process of moving the names and ranks from the old registry to the new one, it is possible that some records might have been overlooked, so please check to make sure all of your ranks and titles are recorded. . . regardless of your style or organization. All existing records will be revised and updated and of course, all IUKF ranks are automatically listed. Our new www.iukf.net website is almost completed. Recent board meeting changes will be incorporated into the new site and revised membership fees and dan test information will be updated at the end of June and will be in effect on July 1st. 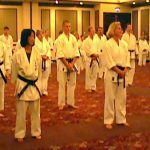 Remember that you can join IUKF and schedule your Black Belt tests by going to www.iukf.net and clicking on one of the two arrows. Membership and dan test administrators will send you requested information and will help you with any question you might have. Christion Maine is chairing a dojo membership committee. Christian will be very pleased to talk with any teacher or dojo owner about all the benefits in becoming an IUKF member dojo. Contact Christion at: whitemountainkarate@roadrunner.com . Of course, all you Canadians can get in touch with IUKF-Canada by sending David Mott an e-mail at david@davidmottmusic.com . Within the next couple days, we will have special Eastern Arts Forums for IUKF-Cuba and IUKF-India. I hope you will drop in to their forums to say hello.